A vice-president of the International Olympic Committee, Kim Un-yong, has been sentenced to two-and-a-half years in jail on corruption charges. He was found guilty by a South Korean court of embezzling more than $3m from sports organisations he controlled, and accepting $700,000 in bribes. Prosecutors accused him of turning sports bodies into private enterprises. The judge said the relatively lenient sentence reflected the 73-year-old's age, and contribution to Korean sport. Kim was also fined $672,000 by the Seoul district court. 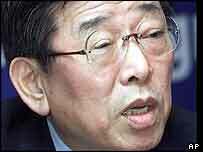 One of South Korea's best-known sports officials, Kim has already stepped down as a national legislator. He was a dominant figure in Korean sport for more than three decades, promoting the martial art of taekwondo overseas and helping it gain recognition as a full Olympic sport. He was also credited with helping win the Seoul Olympics for South Korea in 1988. Kim was among IOC members implicated in a corruption scandal leading up to Salt Lake City's 2002 Winter Olympics. The IOC executive board stripped him of all his Olympic duties earlier this year because of investigations by South Korean authorities and the IOC ethics commission. He was found guilty of embezzling money while serving as chairman of local and international taekwondo federations. The court also found him guilty of accepting bribes from businessmen who wanted to serve on sports committees. Initially claiming to be victimised by the judiciary, Kim later admitted mistakes but said he had always worked for the good of the country rather than himself. The presiding judge said the sentence was less than the prosecution had asked for because of Kim's contribution to South Korean sport. "The generous term reflects his life-long contribution to the global promotion of taekwondo, illness from age and repentance," judge Kim Byong-Un said in his ruling. Kim said he would appeal against the conviction. "He was a major force in Korea's Olympic movement"